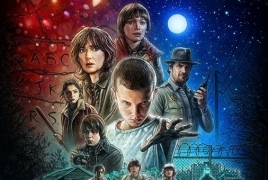 PanARMENIAN.Net - Tangerine Dream have shared cover versions of two Stranger Things tracks, including the show's theme, NME reports. Michael Stein and Kyle Dixon of S U R V I V E - the duo behind the Stranger Things soundtrack - have hailed the legendary German electro band as influence on the music they created for the show, telling Salon: "We listen to a lot of Tangerine Dream and they did a tonne of soundtracks. There's a few key soundtracks by them that definitely influenced us in a lot of ways, like Thief and Sorcerer." Stein and Dixon recently released the soundtrack to Stranger Things in two parts via Apple Music. The first volume of the Texan musicians' soundtrack charted in the Top 40. Stein and Dixon told NME during a recent interview that there wasn’t enough budget for the rest of the band to help create the soundtrack. S U R V I V E have also announced a huge tour of North America which is due to kick off at the Barracuda in Austin on September 30 before wrapping up in Dallas on December 31. Stein and Dixon will also perform the Stranger Things soundtrack live for the first time at Polish festival Unsound in October.